I've always resorted to shampoo and conditioner to maintain my tresses. I use shampoo every other day and the conditioner daily. Because of my everyday conditioner usage, I make sure to pick the best formula to make my hair manageable in whatever weather we experience. 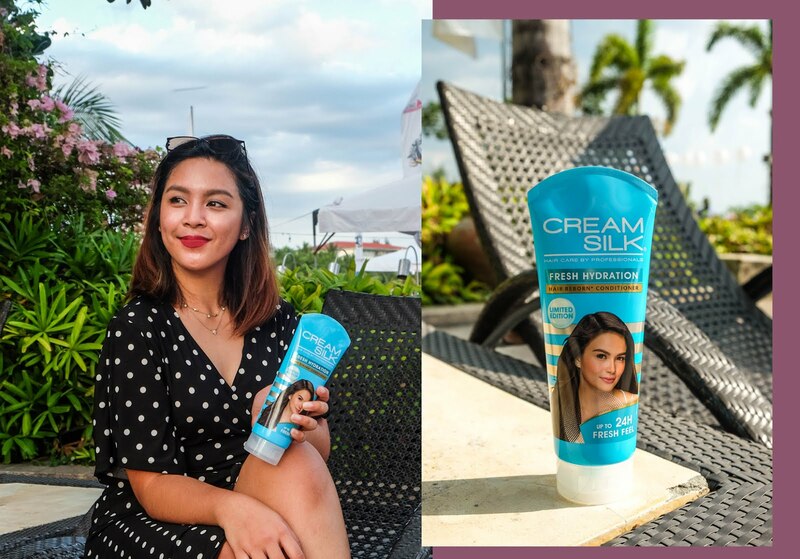 I'm glad that for this summer, I've discovered a product that my hair surely loved: The Creamsilk Fresh Hydration Conditioner. 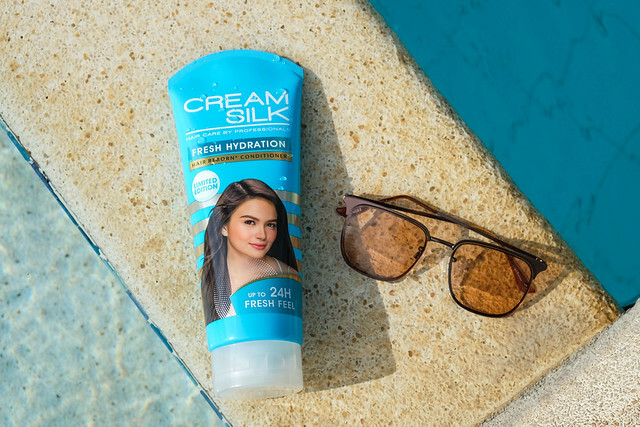 Cream Silk, the country’s leading haircare brand, unveils every Modern Filipina’s fresh new pick for the summer, the NEW Limited Edition Cream Silk Fresh Hydration. Designed specifically to combat summer-dryness, Cream Silk Fresh Hydration is the Customized Solution to keep your hair fresh and hydrated without the greasy feel for up to 24 hours. The aqua blue packaging of this limited edition conditioner from Creamsilk looks refreshing in the eyes. Just how I perceive the freshness and calming waves of the water. I gave the conditioner a whiff and I can immediately tell that it smells lighter than its predecessors. It also has a lighter formula compared to the original Creamsilk product line. Upon using this product on my mane, I was able to rinse it quickly after a few splashes on my hair, giving that squeaky clean feel. After air drying, my hair gave off that light volume. I gave this conditioner a test under the summer heat at Subic yesterday. After taking a bath at 8 AM, I commuted all the way from Cavite down to Quezon City via bus to meet up with the group. It was around 12:30 PM when we left our meeting place and travelled to Subic, Olongapo city for around 2.5 hours. It was by 3:30 PM when we rode the Balangay (a plank boat) and we left for Manila around 8:30 PM. 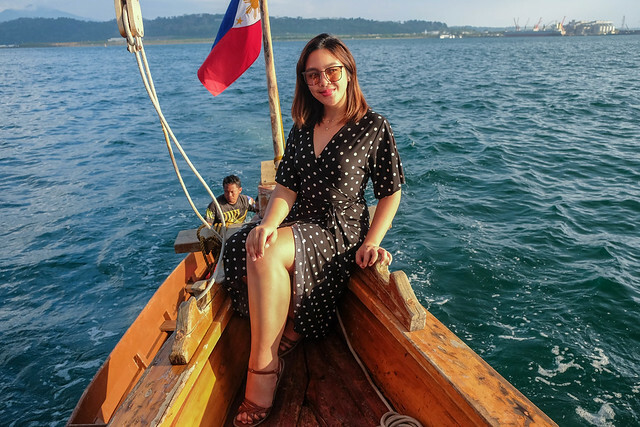 It really felt like summer because of the scorching heat right when we sailed to the water. Because I was having too much fun sightseeing and learning about the boat, I didn't mind my hair at all and just went with the experience. As soon as I got down, I had to do a hair comb since my hair got blown away by the wind a few times. I was impressed when I easily managed some knots on my hair and it was back to its original form in no time. For a pocket-friendly price, the NEW Limited Edition Cream Silk Fresh Hydration is a well thought off product for this summer. It's gel formula consistency instantly won my heart (and my hair) because it left my hair light and clean. It was easy managing my hair all throughout the day just by gliding my fingers through the strands of my hair. Without using other hair care products, I lasted the day with a tad fresh scent and the same hair volume after a long day.